We deployed the Divi theme from Elegant Themes. The advantage of Divi is that it acts as a design platform that sits on top of WordPress rather than as a traditional theme that gives a predetermined look and feel to a website. Divi contrasts with the theme previously used in that regard. A significant advantage of Divi is that it is mobile friendly right out of the box. As a consequence the new website functions well on screens of all sizes. Also as a result of Divi, we were able to streamline the company’s project galleries as well as display them in a much more user-friendly and attractive way. In construction, pictures showing progress and finished product are paramount. Baker Contracting now displays their projects beautifully. And their finished projects really are beautiful. Another new functionality on the website is a contact form. Contact forms are of course quite standard on websites, the reason being that they reduce friction in the communication process. If you are on a website page, it often is easier to submit a contact form right on the page rather than to have to click an email link, launch an email software program, and compose and send an email. Importantly, contact form data is saved on the back end of the website. This offers redundancy in case the email notification of the form fill does not arrive for some reason. 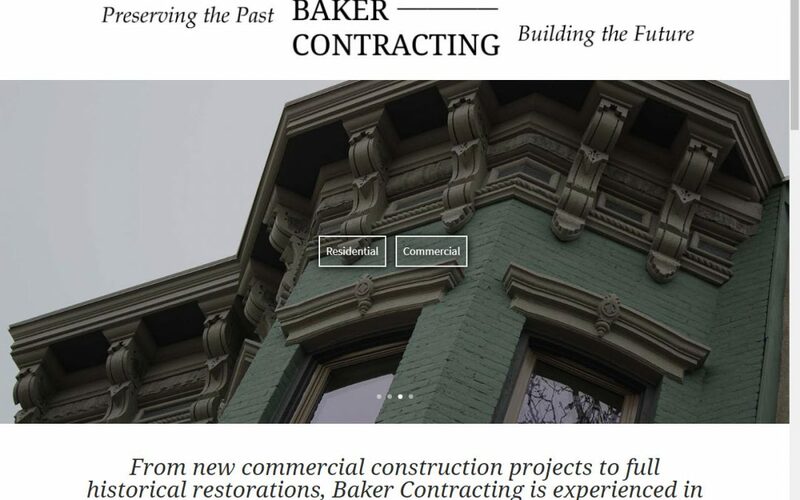 Baker Contracting also hosts their website with GoatCloud. We are able to provide them with a free SSL certificate for secure browsing, which provides comfort to visitors and reassurances to search engines. You can check out Baker Contracting and many of their fine projects at bakercontracting.com.